Coca-Cola Red Neon Hanging Wall Clock / "Vintage Look" - Circa 1910 Style / NEW! This classic Coca-Cola neon wall clock will add a touch of nostalgia to any home! Features include a large 15 face made of real glass, a hand-blown neon ring that lights up in brilliant red, Quarts clock movement (AA battery not included), and a chrome finished rim (bezel). Retro look graphics from 1910 complete this unique clock. This is a great gift idea as well, for any office, game room, garage, den or home! 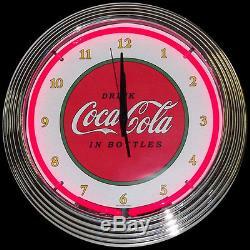 The item "Coca-Cola Red Neon Hanging Wall Clock / Vintage Look 1910 Style / NEW" is in sale since Wednesday, December 14, 2011. This item is in the category "Collectibles\Advertising\Soda\Coca-Cola\Signs". The seller is "californiacarcover" and is located in Chatsworth, California. This item can be shipped to United States, to Canada, to United Kingdom, DK, RO, SK, BG, CZ, FI, HU, LV, LT, MT, EE, to Australia, GR, PT, CY, SI, to Japan, to China, SE, KR, ID, to Taiwan, ZA, to Belgium, to France, to Hong Kong, to Ireland, to Netherlands, PL, to Spain, to Italy, to Germany, to Austria, RU, IL, to New Zealand, PH, SG, to Switzerland, NO, SA, UA, AE, QA, KW, BH, HR, MY, TR, CL, CO, CR, DO, PA, TT, TH, GT, SV, HN, JM, to Mexico, BR.